In recent weeks, UNAC/UHCP formed a homeless women’s outreach coalition with Labor Community Services AFL CIO, United Way, United Way of Greater Los Angeles, Highly Favored: A Blessing to Others, and G.O.A.L. Advocacy Foundation. Lots of planning went into setting up collection boxes, mapping out encampments, and coordinating the delivery of services before the coalition’s first outreach on Sunday, April 9. The first homeless women’s outreach was a huge success! We had a total of 14 volunteers, including UNAC/UHCP members from Sunset, South Bay and Downey. 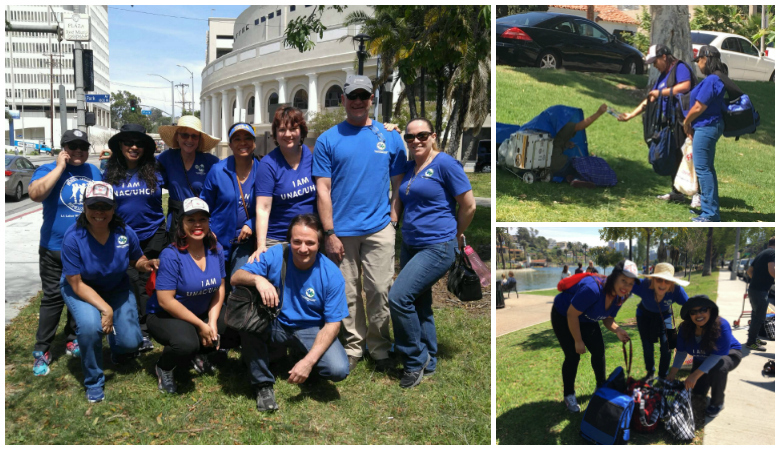 Volunteers visited 20 encampments and distributed food, water and essential items to over 100 homeless individuals in Echo Park and Silver Lake. Thanks to all who worked behind the scenes or made donations to help make a difference in the lives of those who are among the most vulnerable members of society. And special thanks to this amazing group of UNAC/UHCP volunteers! CLICK HERE to view more pictures on Facebook.